The Acorn is considered to be an emblem of luck, prosperity, youthfulness and power, the Acorn is a good luck symbol indeed! It also represents spiritual growth.strength and potential, it was also a Nordic and Celtic symbol of fertility, and immortality. Add these beautiful 100% beeswax Acorn Candles to your tabletop or home decor. 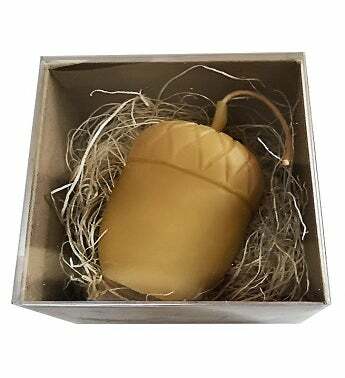 Our 100% beeswax Acorn candle measures 3 inches tall x 2 inches wide. The burn time is approximately 20 hours. These are perfect accents and tabletop decor for weddings, baby showers or any other special occasion parties. The Acorn is considered to be an emblem of luck, prosperity, youthfulness and power, the Acorn is a good luck symbol indeed!